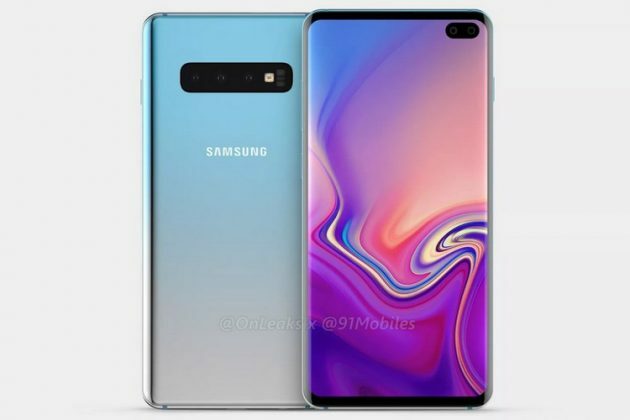 The rumor mill is abuzz with reports that Samsung will launch three versions of its upcoming Galaxy S10 flagship. 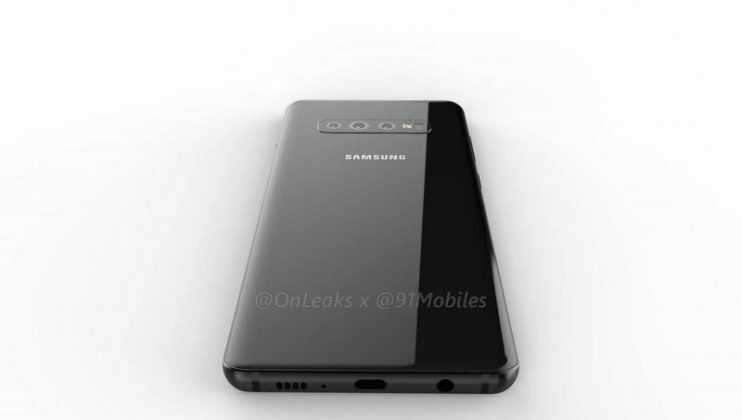 While a triple camera set-up and the Infinity-O display are a done deal for the upcoming flagship, we now have our first look at what the Galaxy S10 Plus might look like, thanks to 5K renders and a 360-degree video based on alleged CAD files of the upcoming flagship. 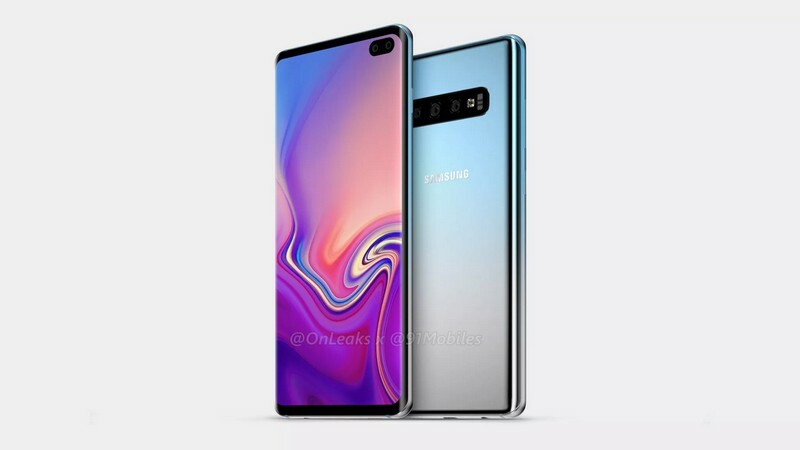 Following in the footsteps of its predecessor, the Plus variant of Galaxy S10 will be more decked-out compared to its smaller sibling and will have a slightly different design if the leaked renders are anything to go by. Starting with the color, the Galaxy S10+ will flaunt a gradient design which bears some resemblance to the Galaxy A9‘s Lemonade Blue color option. 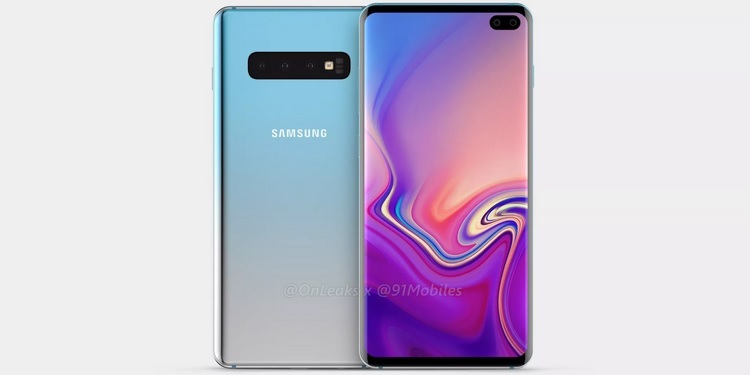 The Galaxy S10+ will feature a horizontally-stacked triple rear camera set-up that will reportedly consist of a 12MP standard wide-angle lens with a dual aperture, a secondary 13MP telephoto lens, and a third 16MP ‘super-wide-angle’ lens. However, 91Mobiles claims that the device will feature a slightly different imaging hardware with a 16MP+16MP+13MP triple rear camera set-up and 8MP+5MP front-facing cameras. The design of the rear camera set-up looks quite similar to the one on the Galaxy Note 8, except for the absence of a fingerprint sensor that will be replaced by an ultrasonic in-display fingerprint sensor from Qualcomm. Another important thing revealed by the new leak is that the S10 Plus will retain the headphone jack. Another key change is the design of cutout on the Galaxy S10’s display to accommodate the two front cameras. We’ve previously reported that the Galaxy S10 will feature the Infinity-O display that will have a single hole drilled at the corner of the display to house the front camera. But as per the latest leak, the Galaxy S10 Plus will come with a slightly different punch-hole design to house two front-facing cameras. 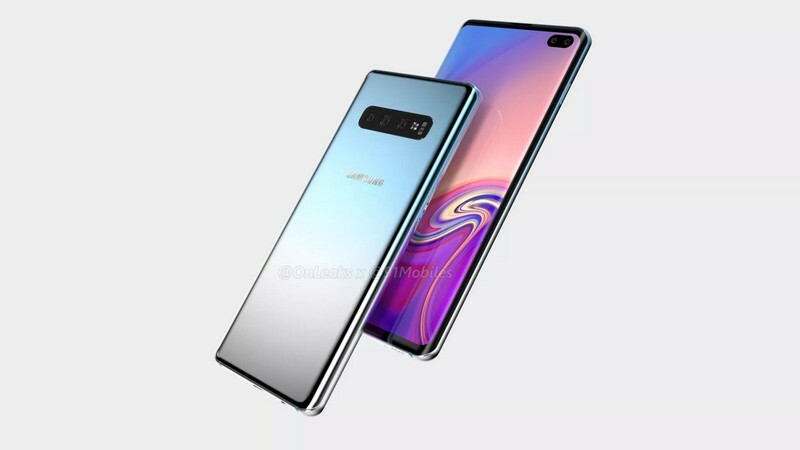 Perhaps, we might see the same design on the special 10th anniversary Galaxy S10 edition that will reportedly pack a total of six cameras, four on the rear and two on the front, alongside support for reverse wireless charging and 5G connectivity. As for the Galaxy S10 Plus’ specifications, the device will reportedly pack a 6.44-inch 1440 x 2960 Super AMOLED display and will be powered by the Exynos 9820 SoC paired with up to 8GB of RAM, while a 3,700mAh battery with support for wireless charging will provide the juice. On the software side, the Galaxy S10 Plus will run the next iteration of Samsung’s software experience on smartphones, One UI, based on Android 9 Pie.